RAND's annual reports highlight the greatest accomplishments of the previous year for our donors, members, friends, and the public. Electronic copies of the most recent annual reports are available here. RAND's research and analysis address issues that affect families and communities around the world — such issues as health care, drug use and drug markets, infrastructure planning, and science and technology. As RAND celebrates its 70th anniversary, the 2017 Annual Report describes the many ways in which RAND research has helped — and is helping — people around the world lead lives that are safer and more secure, healthier and more prosperous. RAND's research and analysis address issues that affect families and communities around the world — such issues as corruption, health, education, terrorism, and transportation. RAND's 2016 Annual Report describes the many ways in which RAND uses rigorous, unbiased, evidence-based research and analysis to help people around the world lead lives that are safer and more secure, healthier and more prosperous. RAND's research and analysis address issues that affect families and communities around the world — such issues as security, health, education, addiction, technology, violence, and privacy. RAND's 2015 Annual Report describes the many ways in which RAND develops solutions to public policy challenges to help make people around the world safer and more secure, healthier and more prosperous. 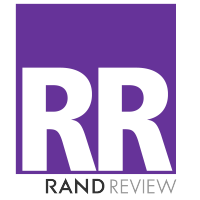 RAND's research and analysis address issues that affect families and communities around the world, including security, health, education, sustainability, technology, growth, and development. RAND's 2014 Annual Report describes the many ways in which RAND develops solutions to public policy challenges to help make people around the world safer and more secure, healthier and more prosperous. 2012 RAND Annual Report: Who Are You Listening To? RAND's 2012 Annual Report illustrates the increasingly effective ways in which RAND disseminates its research findings and recommendations to help individuals, communities, and nations be safer and more secure, healthier and more prosperous. Amidst all the noise and static of today's policy debates, people are listening to RAND. The RAND Corporation is a nonprofit institution that helps improve policy and decisionmaking through research and analysis. RAND's 2011 Annual Report demonstrates the scope of RAND's work and illustrates the ways RAND disseminates its research findings and recommendations as widely as possible to help individuals, communities, and nations be safer, healthier, more secure, and more prosperous. RAND's 2010 Annual Report — with its focus on multinational challenges, healthy societies, armed forces and resources, education, financial stability, safety and justice, infrastructure and environment, and terrorism — demonstrates the scope of RAND's research and analysis and illustrates the ways RAND disseminates its findings and recommendations as widely as possible to benefit the public good. RAND's work in 2009 rests upon more than 60 years of sustained investment in people and ideas, and demonstrates how this investment has helped build and will contribute to building a better world. RAND's federally funded research and development centers (FFRDCs) also produce annual reports. To access FFRDC annual reports through 2012, browse our defunct annual report series. FFRDC annual reports after 2012 are available in our corporate publication series.